The CAT 3-in-1 Ride-On by Mega Bloks is the perfect ride-on for anyone who has a little construction lover! The large steering wheel on the front with featured controls mimics real truck sounds and creates an exciting ride for kids to imagine driving to their construction site. 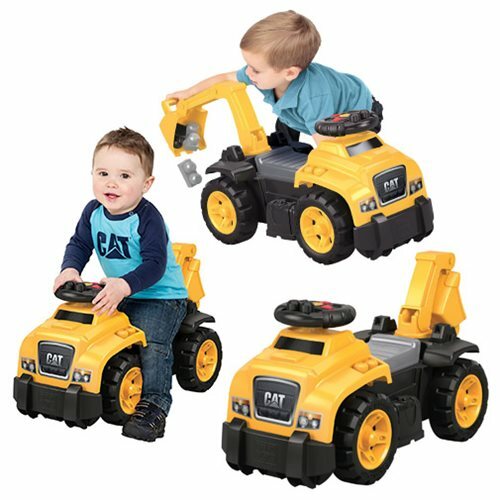 Turning around in his seat, your construction fan can take control of the new pivoting excavator arm and scoop up the 10 included First Builders CAT-themed blocks just like a real loader! Store these blocks and more under the seat in the storage area, tuck in the excavator arm and your little tractor driver is ready to roll on to his next job! Your child can play like a real construction worker with the CAT 3-in-1 Ride-On! Measures approximately 24-inches long, 13-inches tall and 12-inches wide. Ages 1-3.